Ted Glasoe leads workshop at 2019 convention. CHICAGO — Illustrating his points on photography and graphic design with beautiful images he took himself, Ted Glasoe, an artist and designer specializing in images of Lake Michigan, led a session of publication editors as part of the joint convention of the Religion Communicators Council (RCC) and Associated Church Press (ACP) on April 13. Glasoe has been a professional graphic designer for more than 20 years and a professional photographer for more than 10 years. His presentation was designed to give editors a fundamental understanding of photography and graphic design as they relate to print and web use. Christian Piatt leads workshop on podcasting noting consistency is key. With a quick list of seven tips for podcast success, Christian Piatt with Square Core Media told the Associated Church Press (ACP) and Religion Communicators Council (RCC) members that podcasting should be part of any group’s brand and media outreach. The professional development workshop was a part of the recent joint convention for the two communication organizations, ACP and RCC, that was set in Chicago. Piatt, who came early to the podcast universe through work with Homebrewed Christianity’s Culture Cast, now has a company which provides services to organizations wanting help with their own podcasts. Are you prepared for a confrontational interview? Have you considered the most difficult, awkward or embarrassing questions you might be asked? Have you planned brief responses to those questions in advance? If not, you may not be as prepared as possible for the media environment in which religious communicators find themselves today. With their workshop, “In the spotlight: handling media interviews like a pro,” Anuttama Dasa and Ryan Koch covered the basics of media relations was well as tips for effective interviews. The workshop was one of several Accreditation in Public Relations (APR) offerings at the 2019 annual convention of the Religion Communicators Council that met in Chicago. Charles Whitaker offered tips for working with freelancers at the RCC/ACP convention. What makes a good editor? Someone with a clear vision and able to effectively communicate that idea to writers, especially freelancers. Charles Whitaker, in his workshop, “Working with Freelancers,” continued the Management Track into Friday morning at the Religion Communicators Council national convention. The room was filled with questions and conversation around the challenges that face our publications, editors, and how we gather news. A good editor, Whitaker says, is only as good as his or her list of contacts. A good editor brings resources to the publication based on years of relationships, connections that have been grown and nurtured through good communication and collaboration. Rev. Jonathan Brooks, Senior Pastor of Canaan Community Church and author of “Church Forsaken: Practicing Presence in Neglected Neighborhoods,” shared how his neighborhood rewrote its negative narrative to bring positive changes to the community. He was featured speaker for a Friday lunch plenary session at the Religion Communicators Council (RCC) and Associated Church Press (ACP) joint national convention in Chicago. Rev. Brooks was raised in West Englewood, a neighborhood on the south side of Chicago, where gun violence is common, and the typical advice given to young people to better their lives is to work hard and move away. Brooks emphasized that communities need to change their attitude and embrace, love, and take ownership their neighborhoods. Katherine Kerr Kabatzky leads the Crisis Communication workshop. It’s not a question if your organization will have a crisis, but rather when it will happen. So best be prepared in advance to handle whatever comes. That was the message of Katherine Kerr Kubatzky, APR, during a breakout session on crisis communications during the Religion Communications Council and Associated Church Press joint conference in Chicago. Kerr Kubatzky, who owns Polaris Non-Profit Communications in Georgetown, TX, described a crisis as “anything that threatens the operations and /or reputation of an organization.” The crisis need not be a world-shaking event. On a local level it could be prompted by inappropriate behavior, vandalism, an accident or assault or by natural causes such as a flood, hurricane or fire. Wilbur Award winners receive a handcrafted stained-glass trophy and national recognition for their work. While the #MeToo movement may seem like a difficult topic to discuss openly, three scholars were able to speak to this, not just with empathy, but with passion and conviction at the second plenary of #RCCACP2019. The #MeToo movement has created a platform calling for change around gender issues in nearly every sector of society. This panel took an intersectional approach to exploring and challenging the present state of gender representation in media and media production. The panelists, all engaged in a range of ongoing efforts to raise awareness about gender disparities, were Dr. Glory Dharmaraj, U.S. coordinator for the Global Media Monitoring Project (GMMP) of the World Association for Christian Communication; Dr. Sarah Macharia, global coordinator of the Global Media Monitoring Project; and Dr. Karri Whipple, a speaker, writer, and activist who promotes transformative justice work within communities. Gregg Brekke leads “Backpack Journalism: Multi-platform story creation” workshop. In less than a generation, the role of a journalist has changed significantly. Stories which were once produced by teams of four or five people in traditional newsrooms are now expected to be produced by a single journalist. There are new demands on content creators. Writers are now expected to be photographers. Video producers are expected to write. Nearly everyone is expected to be able to produce a multi-format story. Using the DPDPD acronym, Brekke presented a process toolkit to help journalists and aspiring storytellers with the current reality. The room was chilly but the spirit warm when President Jackie Fuller called the annual meeting of the Religion Communicators Council (RCC) to order on Thursday, April 11. Executive Director Shirley Struchen reported that RCC has 420 members at last count and 57 were registered for this convention event. The Associated Church Press is meeting with us and have approximately 47 in attendance. In another link to the birthday number, the membership team headed up by Fuller and former president, Casey Tom, announced a special rate of $90 for new members. In addition, the membership team is specifically targeting Jewish, Muslim, African Methodist Episcopal (AME) and Sikh faith communities to invite membership. The smallest details so often tell the biggest tales. In the case of the Communication Research and Planning workshop at RCC’s 2019 annual conference, it was the punctuation in the featured PowerPoint’s title that gave it up. That punctuation, an exclamation point, in Heidi Thompson’s presentation – “One Page Communication Plan!” – made it clear that, above all else, the plan’s the thing. The one-page plan is “getting back to basics,” but it’s much better than staring at and starting from a blank page of paper, said Thompson, an organizer, marketer and publishing executive with 25 years of nonprofit experience. “Get agreement on the ‘Big Stuff’ up front,” Thompson said, and you have something to refer to throughout the process. That ensures everyone working on a project is on the same page, and it forces the team to set priorities because there’s only one page for all major aspects of the plan. Keeping the plan to one page also keeps it accessible to everyone. More than a hundred journalists, editors, publishers and other communications professionals convened April 10 at the Fourth Presbyterian Church in Chicago for the combined annual conventions of the Religion Communicators Council (RCC) and Associated Church Press (ACP). The convention opened with a challenge from its organizing committee: in a world of chaos, “What are we doing as communicators to make it better?” The opening plenary by award-winning journalist and author Judith Valente, senior correspondent for NPR affiliate WGLT Radio and writer for U.S. Catholic and National Catholic Reporter, explored that challenge and offered insights drawn from the deep well of Valente's observation tempered by her years of experience with the Wall Street Journal, Washington Post and PBS-TV. Matt Preven, sales engineer at Sizmek, absolutely delivered a home run with his workshop presentation on the importance of engagement in social media on opening day of RCC’s joint convention with Associated Church Press (ACP) in Chicago. Three of the 2019 DeRose-Hinkhouse Award Best of Class winners (L to R): Heidi Parsons, Brilliant Star / Bahá’í National Center; Jeff Huett accepting the award on behalf of Aaron Weaver, Cooperative Baptist Fellowship; and Rae Grant, accepting the award on behalf of Tara Barnes, Response magazine, United Methodist Women. CHICAGO — In 2019 the Religion Communicators Council (RCC) presented more than 90 total winners of the DeRose-Hinkhouse Memorial Awards recognizing quality and achievement in about 60 categories of communication and public relations on Wednesday, April 10 at the annual convention. Active RCC members, who demonstrate excellence in religious communications and public relations, compete for the honors every year. These peer awards are named in honor of the late Victor DeRose and the late Paul M. Hinkhouse who were leading lithographers in New York City and longtime supporters of RCC. A strong interest in and a concern for excellence in communication were shared by the friends and business partners. This year’s judges included professionals from educational institutions, religious organizations, and private advertising and marketing teams. News, feature, promotional and other materials in all forms of media – print, electronic and digital – with either local, regional or national reach, were recognized. 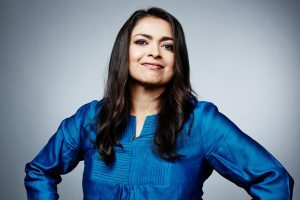 Moni Basu, University of Florida College of Journalism and Communications Michael and Linda Connelly Lecturer for Narrative Nonfiction, is the recipient of one of 22 2019 Wilbur Awards from the Religion Communicators Council (RCC). Her entry, “A Gunman Killed His Brother. Now Farris Barkat is on an American Journey,” received the top prize in the Digital Communications: Online News Stories category. The story focuses on the murder of three Muslim family members in North Carolina and their brother’s pursuit to honor their memory and promote peace and acceptance in the community. She produced the story in 2018 when she was a senior writer on CNN Digital’s Enterprise team. She joined the College in fall 2018. Chicago – Plenaries, Panels, and Keynotes – Oh my!